Bathrooms – it’s all black and white!!! Now I am not normally a huge fan of the whole black and white look that’s really popular at the moment. I just can’t help it, I am colour fan! ……fanatic!! 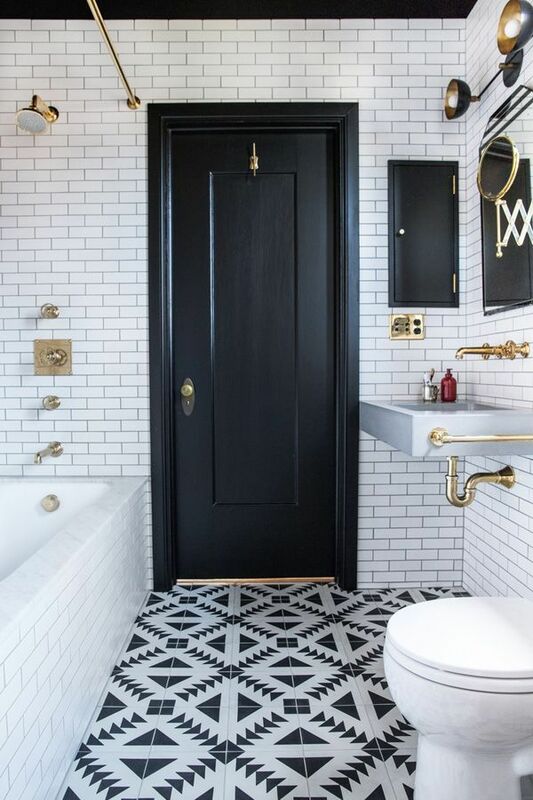 But that said, during one of my regular marathon pinterest sessions, I noticed that I was being drawn to monochromatic bathrooms and not minding one little bit!!! It got me thinking that it was a good look for a bathroom, the neutral simple palette is soothing to the eye, perfect for relaxing especially in the tube. 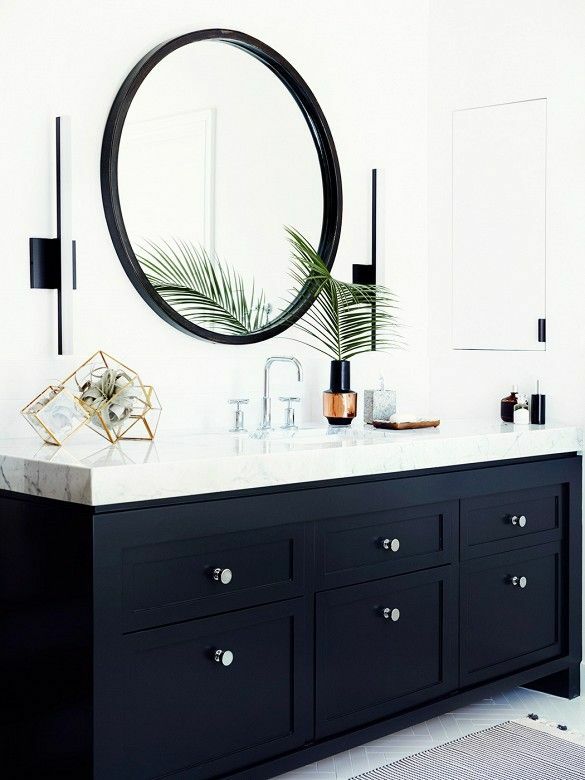 Also as most bathroom fittings (baths and basins) are white, adding black to the mix can create a stunning contrast. As you will see from the images below, a pop of gold / brass adds warmth and a bit of sophistication. Katie Martinez designer this Oakland bathroom. Again a patterned (different style) tiled floor adds interest, the gold fittings add real punch to the b/w palette. (This is my favourite). 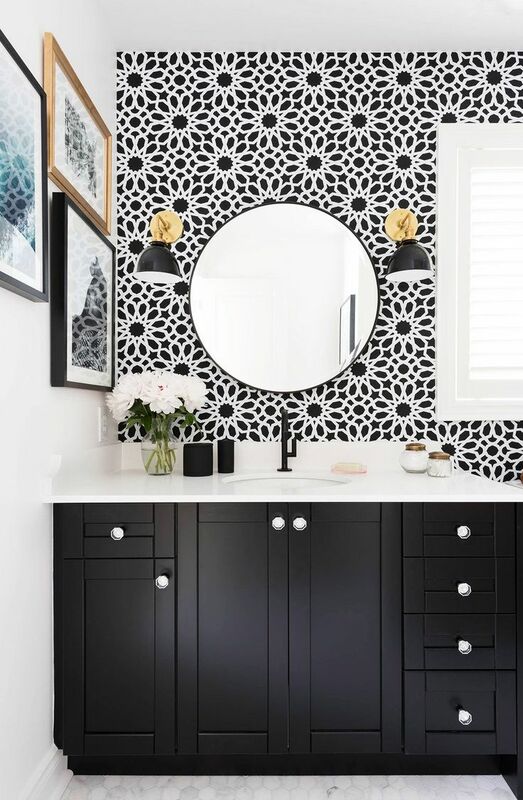 This bathroom by also uses pattern to add contrast but this time on the wall (how amazing is this wallpaper???) 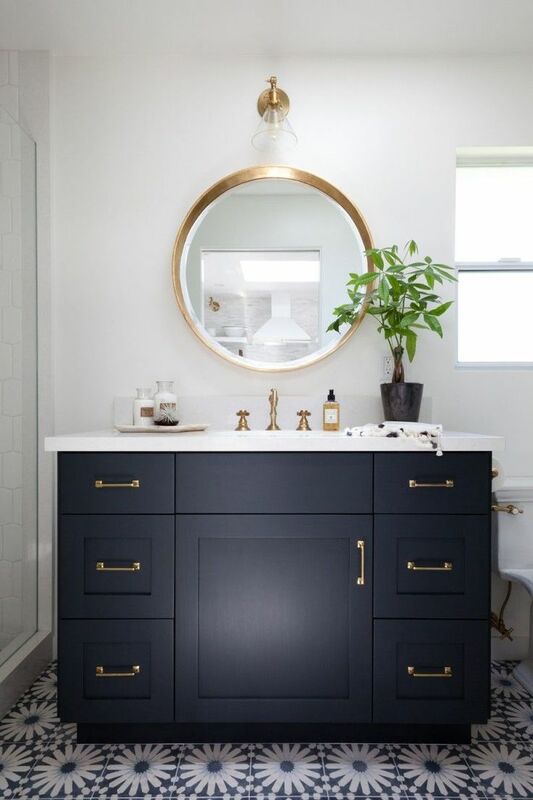 The black cabinetry looks great, I would have considered using gold door knobs to tie in with the other gold pieces. But that’s my only (small) change, still gorgeous. Not sure who the designer is to link!!! This gorgeous bathroom (ohhhh those mirrors sigh!!!) is by the talented Grag Natale. This one uses a little less black, it’s tiles on the wall not wallpaper, but wow it still packs a punch. Just so light and sophisticated. I can only dream!!! Hope your feeling the inspiration people, black and white bathrooms are the way to go!!! If you still need convincing then check out more inmate on my pinterest bathroom board.